Rather than leave on a Friday after work, I opted to choose an early morning Saturday flight to head to New Mexico. That being the case, I wouldn't be taking the lone direct flight that JetBlue offers in the evenings, arriving in Albuquerque at 11pm Mountain Time. Also, I wanted to take advantage of my status with Delta. I would however, be taking the JetBlue redeye that leaves Albuquerque close to midnight every night, headed back to New York. So, begrudgingly, I woke at 4:30am and walked down the street to the bus station to board the Q70 shuttle to take me directly to LaGuardia. The 6am flight boarded quickly, and I quickly passed out before we took off; I ended up sleeping the entire flight en route to Atlanta. I grabbed a bite to eat at the airport lounge before heading to my gate across the airport in Terminal B. Despite the slim pickings at the lounge, I got upgraded to First Class on my ATL-ABQ leg, so I ended up getting a decent breakfast on the flight over. We landed in Albuquerque just before 11am, and I headed outside to a shuttle waiting to take me to the Rental Car Center. 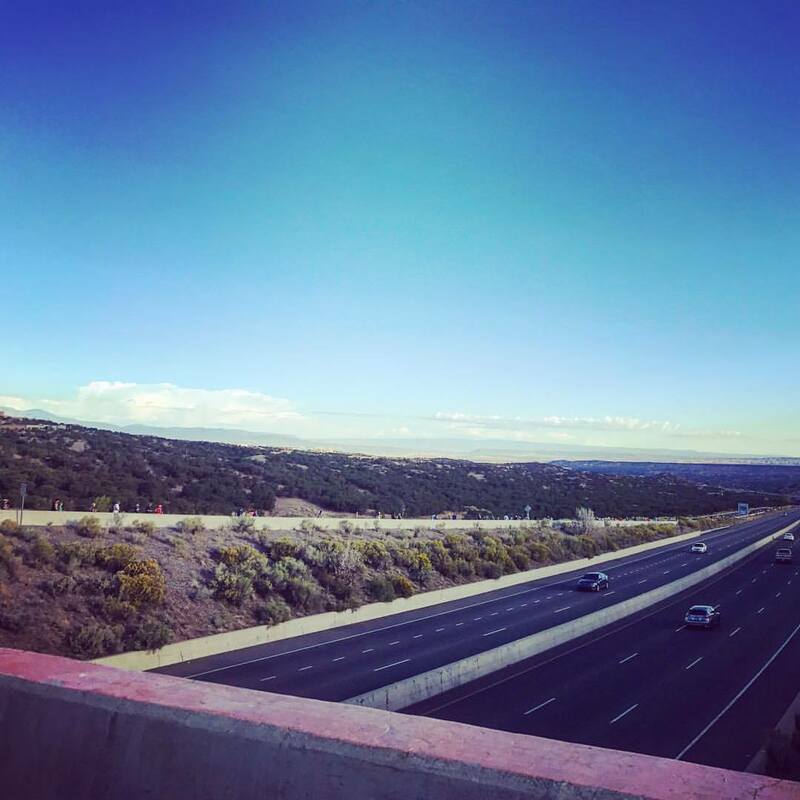 I got myself settled with a rental car, and proceeded with my hour-long drive up I-25 to Santa Fe. 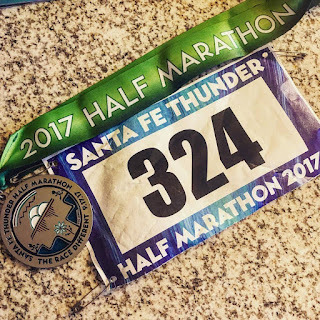 I got into Santa Fe close to 12:30pm making a quick Starbucks stop before heading to the Courtyard Hotel, where I was to stay for the night. My room, though, wasn't ready yet, so I headed to the Buffalo Thunder Resort and Casino, where packet pickup was held. This was also the site for the finish line for the race. 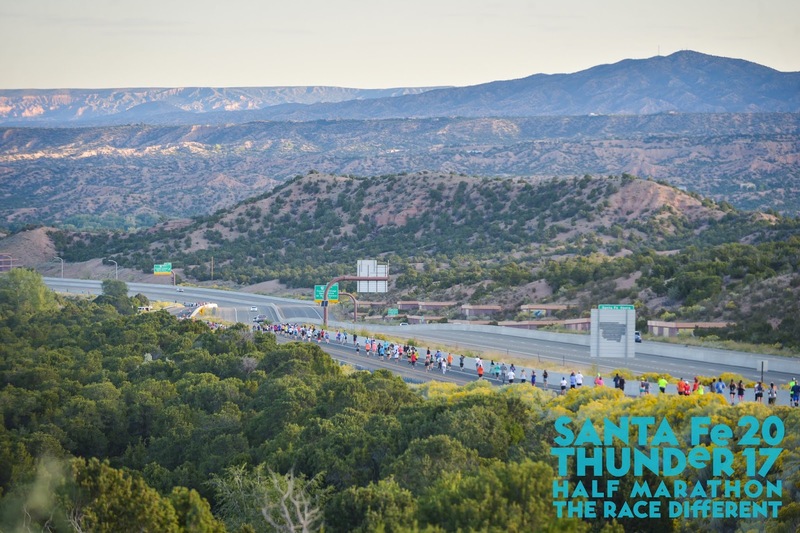 While there, I got to meet with Joseph Karnes, race director for the Santa Fe Thunder Half Marathon, and discuss logistics of what time to meet the following morning. With much of the afternoon still left to take advantage of, I decided to drive out toward Los Alamos and make use of my free afternoon by touring Bandelier National Monument, a historic landmark preserving the homes of ancestral Puebloans of the southwest. 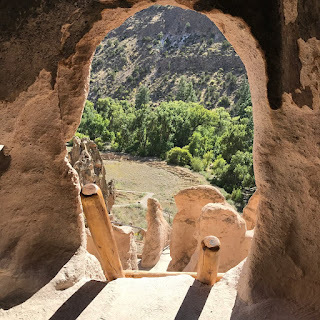 Most of the pueblo structures and dwellings, built into the compacted volcanic ash walls of Frijoles Canyon, date to as early as 1150 AD and up to 1600 AD. After parking my car at the visitor center in the town of White Rock, a shuttle bus took us 25 minutes along the windy road into the park. 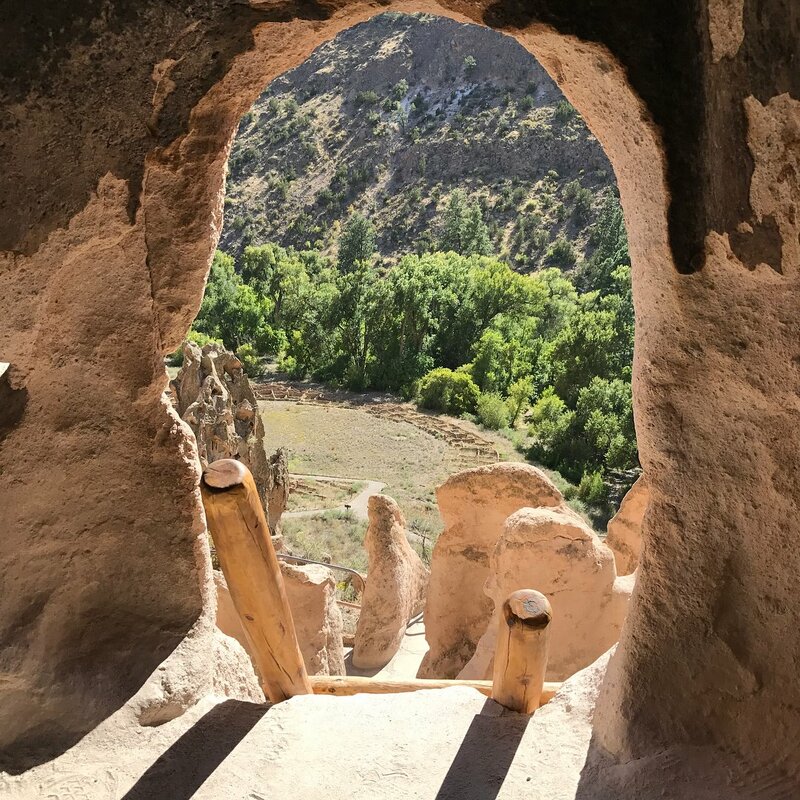 The walking tour is self-guided, and follows the Main Loop Trail, measuring roughly 1.2 miles roundtrip, with an additional mile extension to the Alcove House dwelling built 140 feet above the canyon floor. Many of the dwellings can only be accessed by ladder. 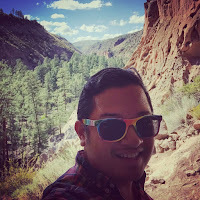 Additionally, the canyon, which has a creek that runs through it, has abundant wildlife, including deer, which often come down to the trail unafraid of visitors. Dinner with friends in Santa Fe! 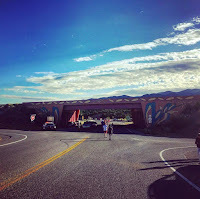 I spent a little over an hour doing the self guided tour before taking the shuttle back to White Rock and then discovering what I could of Los Alamos (birthplace of the first atomic bomb––the primary objective of the Manhattan Project by Los Alamos National Laboratory during World War II) before heading back to Santa Fe. 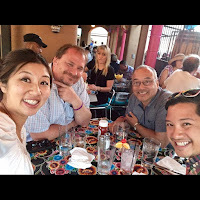 I met up for dinner with my friend Pretty, her husband Matt, and their friend Robert, all from California. After dinner, we hit up the city's central Plaza, enjoying the ambience and the celebrations commemorating Mexican Independence Day, before going our separate ways and heading back to our accommodations for the night. Another early morning wake up call was ahead, and I was out the door to drive up to Fort Marcy for the race, arriving about 6:45am. 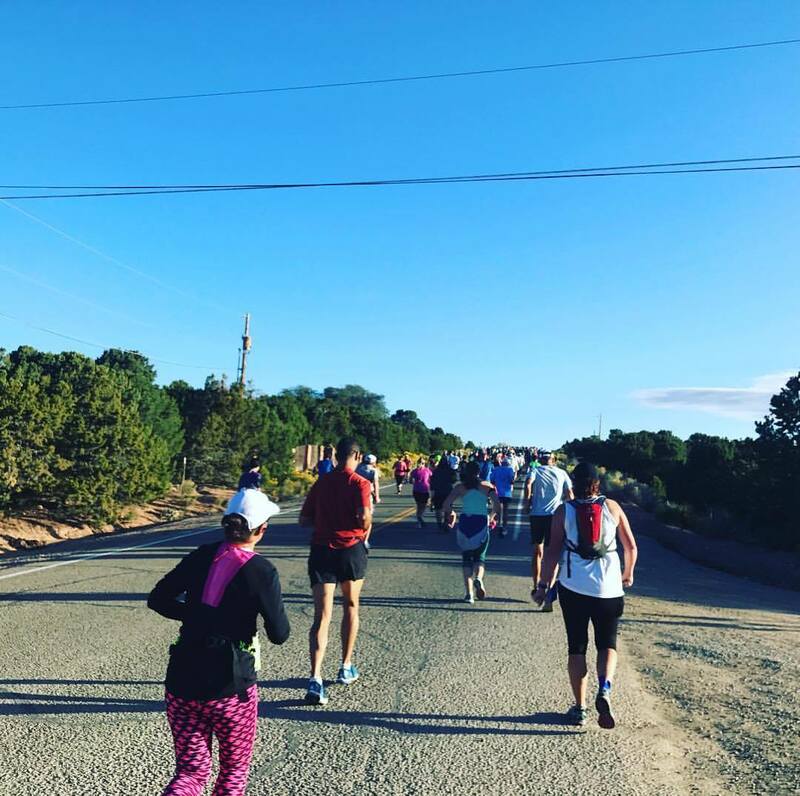 There were ample parking spaces at the start, and it was actually kind of chilly as runners began to assemble on the Old Taos Highway, which was closed off for the start of the race. 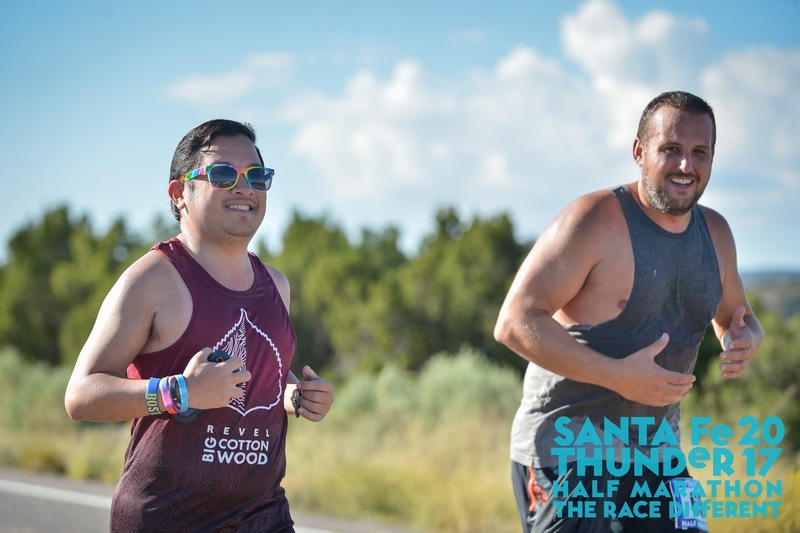 I met up with the announcer, Mark Bravo from Oklahoma City, and introduced myself, while runners began filing onto the street as the shuttles began to arrive from the Buffalo Thunder Casino. 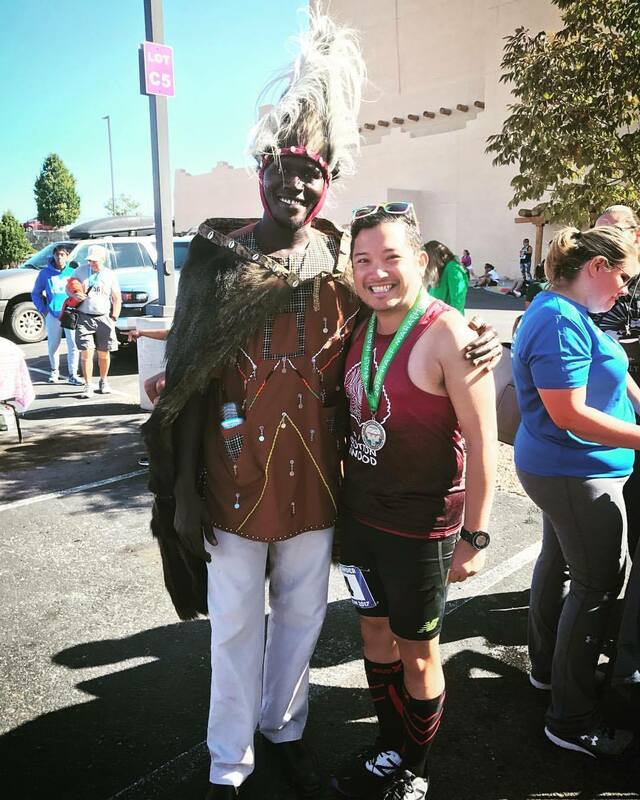 With Kenyan drummers starting off our morning to an energetic start, I headed to the small start stage, set up to have me sing the National Anthem, checking off the state of New Mexico in the process. Heavy breathing on this nasty uphill. 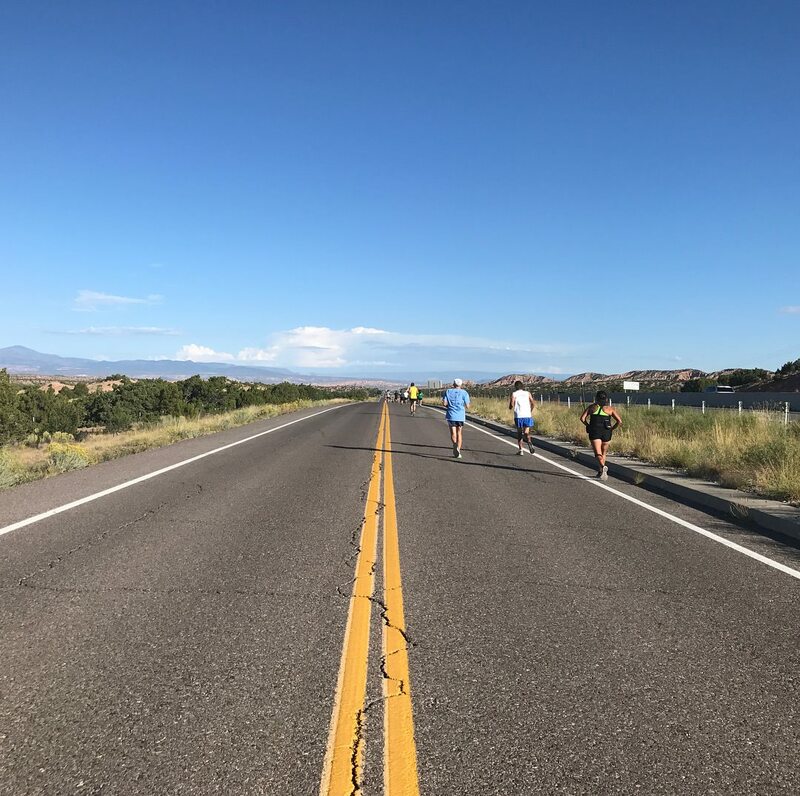 At the sound of the antique 4-foot long kudu horn by Abraham Kosgei, co-founder of Global Running Culture, we were off, running along the closed Old Taos Highway. Almost immediately, the elevation began to take its toll as there was a 300 foot climb over the first two miles, and at 7000 feet of elevation, it was SO DIFFICULT. 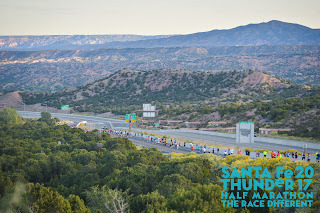 I begin to take walk breaks, as lots of more seasoned and non-elevation burdened runners pass, including several folks invited by the race director: from Kenya, and even the Tarahumara from the Copper Canyon region of Mexico who were featured in Christopher McDougall's 2009 best-selling book Born to Run. One of these is a girl in a full dress and wearing sandals, who passes me at a high speed; it turns out she's 16 years old! 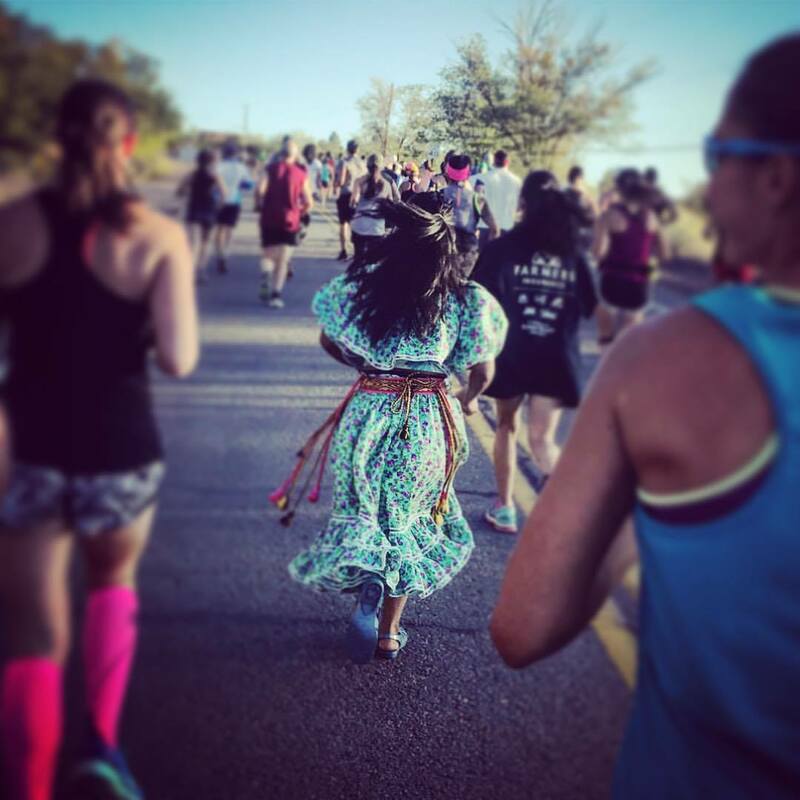 Members of the Tarahumara tribe of northwestern New Mexico are invited each year to run in this race! 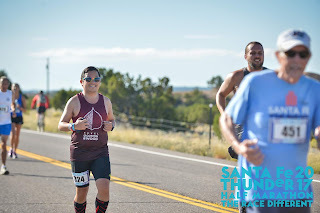 My first two miles were the slowest of the entire race. 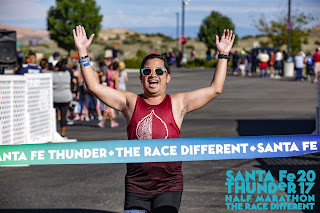 Mile 1 clocked in at 12.5 minutes, while my second mile was slightly worse at 13 minutes. 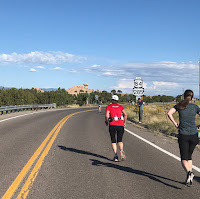 During the second mile, we end up running (or in my case, walking and catching my breath) up some narrow pathways before finally turning left and encountering our first water stop, as we go over the Paz Bridge, crossing over US-285. Finally, we are going downhill. 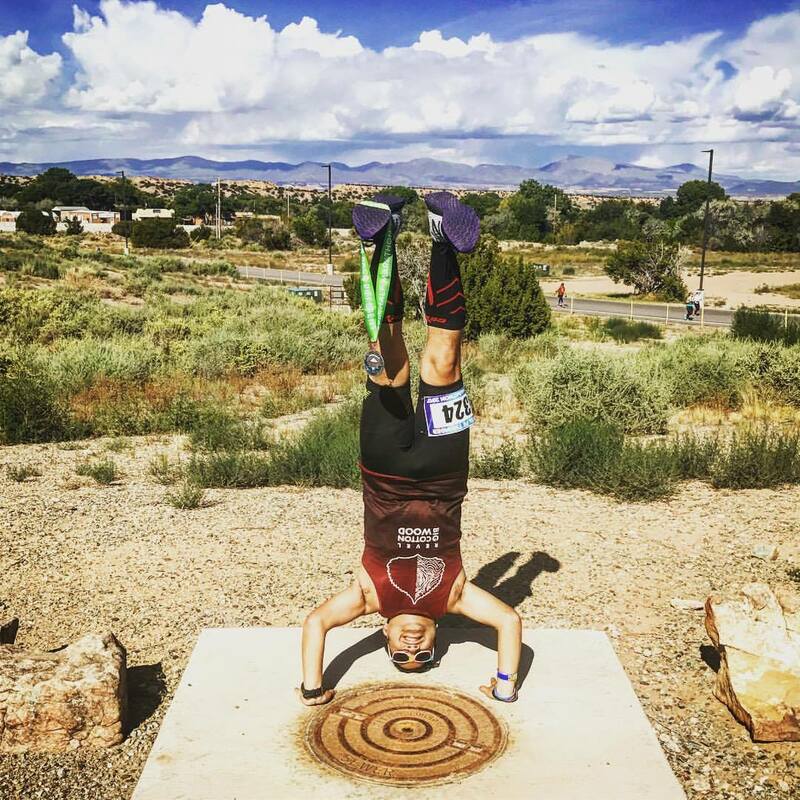 Gravity is definitely my friend as I'm able to hurdle past the mile 3 marker with an 8.5 minute mile! 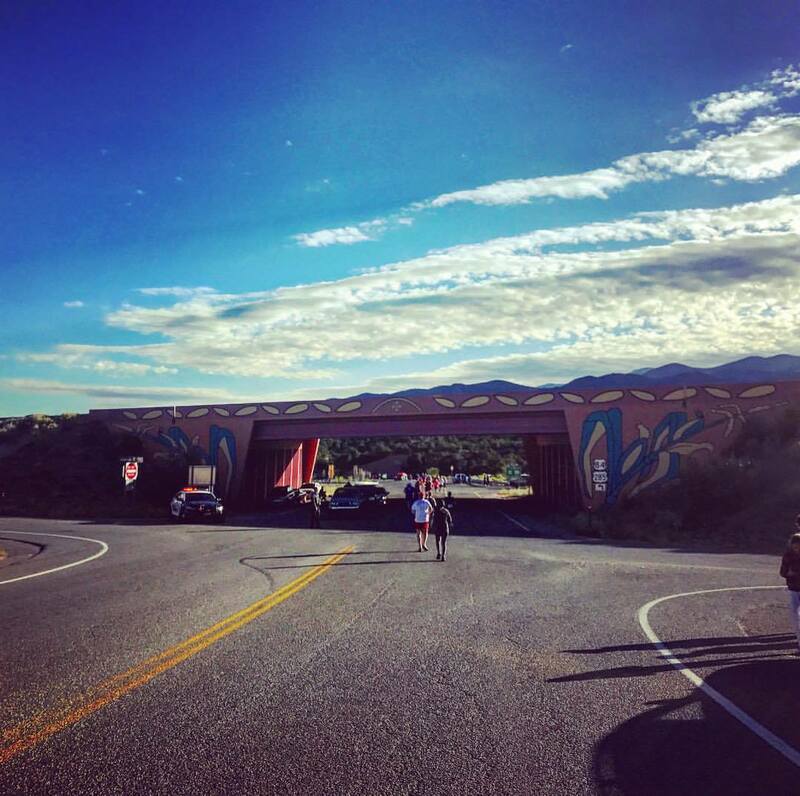 Overpass Bridge over US-285, and a rocketing downhill! After crossing the Paz Bridge, we began to run along the west side of US-285, along Opera Drive, the frontage road that leads all the way up to the Santa Fe Opera. 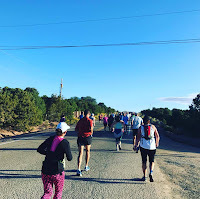 At around 3.5 miles in, we turn right and run through an underpass along Avenida Monte Sereno, then proceeded through the village of Tesuque along Tesuque Village Road. 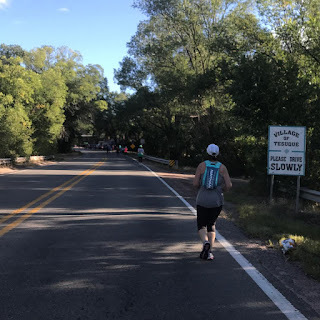 We continued to run downhill, clocking in another sub-9 minute mile at mile 4, then running through the village at a decent pace. It would be another couple miles before we turned once again, at mile 6.5. Rocketing down the gradual downhill and flats. 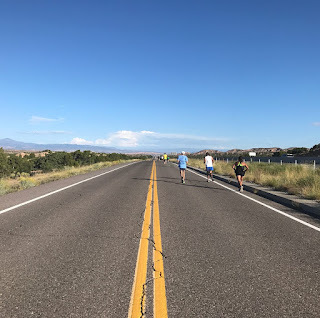 Past Tesuque, we ran over the highway and then continued again along the west side of the highway, where my pace began to slow a bit. I was running still running relatively quickly, but my pace had slowed to sub 10 minute miles. Eventually, I passed the Camel Rock landmark near the 10 mile mark. Cars were speeding down the other lane of road, having turned off at locations where they were not supposed to, and the police rushed over to get them to turn back and off of the closed road. One mile left, the casino sign in view! 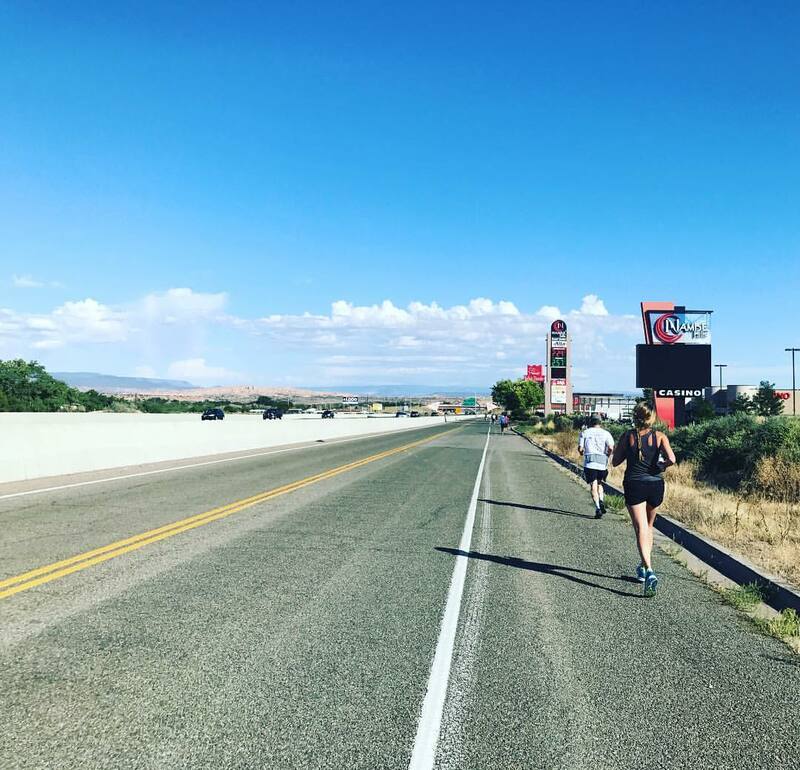 At mile 11, we experience our first real uphill section since the opening two miles of the race, as we climbed over Buffalo Thunder Road, and run on an overpass over the highway once more. With less than two miles left to go, we run along the east side frontage road before turning right to head into the Buffalo Thunder Casino parking lot. We had another short little uphill to conquer, to get from the street to the parking lot. Eventually, I cross the finish line in 2:12:32. 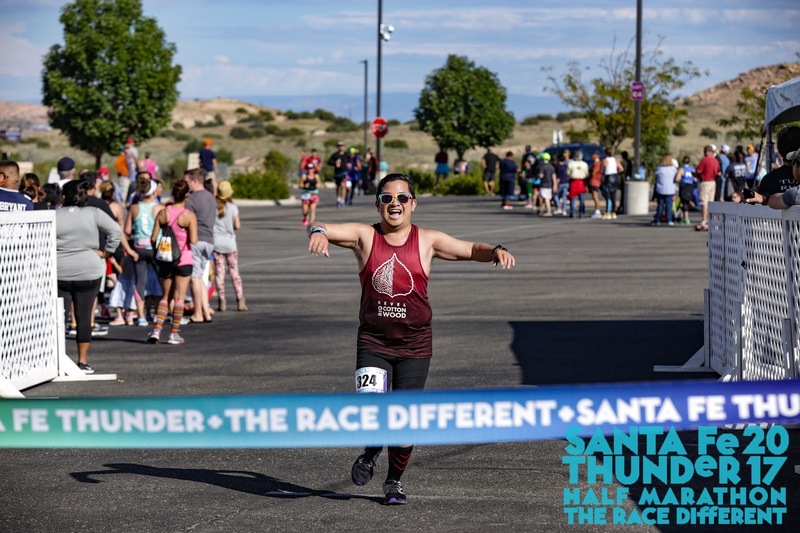 If they could, volunteers at the finish line kept a finish line tape up that each finisher could "break," which was nice as usually that's reserved for the winners of the race. After finishing, I was able to wait for my friends Pretty and Ray to come in. 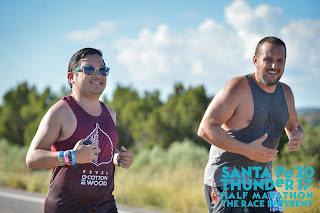 I also find Randy, a fellow Half Fanatic and Marathon Maniac, with the tent he put up for the race, and where I am able to quickly find shade. Before leaving, I of course take my headstand photo, finding a great spot showing off the mountains in the background, as well as taking a photo with Abraham, who played the Kudu at the beginning of the race. 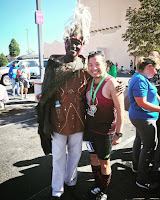 Originally from Kenya, Abraham was named to the Kenyan Olympic team for the 2000 Olympics in Sydney, and eventually settled in Pojoaque, New Mexico, where he founded Global Running Culture, the not-for-profit organization that heads up this race and betters the lives of youth through the powers of sport and education in three communities where running is a vital part of the culture: northern New Mexico, the village of Matunget, Kenya, and Copper Canyon, Mexico. 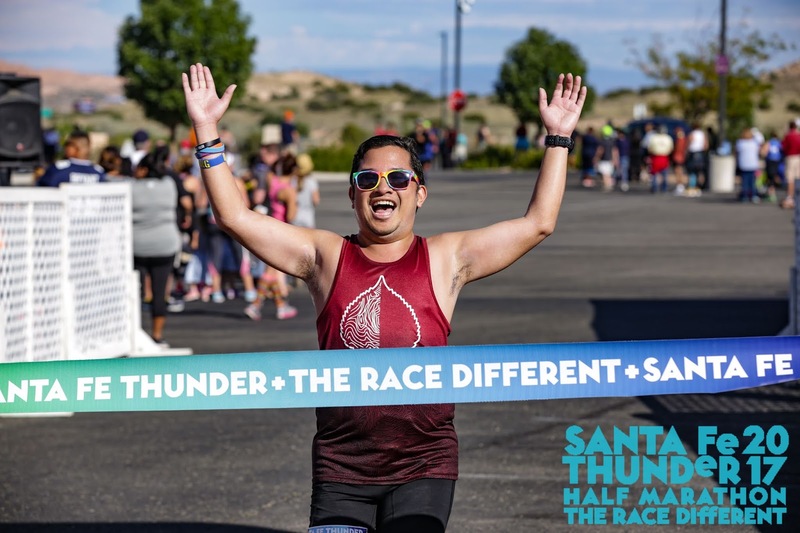 Race proceeds/registrations go toward assisting this great organization! After the race was over, I walked over to the area where were directed to catch a bus shuttle back to the start area at Fort Marcy; however, unfortunately, we were sitting out there for quite some time, with it arriving nearly half an hour later. I desperately needed a shower and air conditioning, so once I got back to my car, I headed straight back to my hotel. I checked out, and planned out the rest of my day, as I wouldn't be heading back to Albuquerque until later that night for my redeye flight back to New York. After researching, I found a great Mexican restaurant, Blue Corn, where I was craving a Navajo taco to have for lunch. I also found a nice coffee shop nearby, called Iconik, where I got to spend some time to recharge my phone. 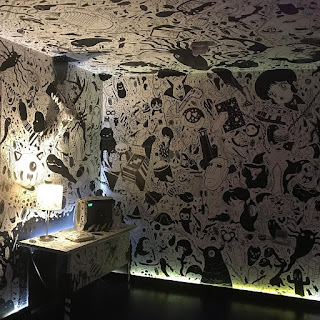 With still a quite a bit of the late afternoon and evening to go, I decided to check out Meow Wolf, an immersive arts and entertainment experience. Opened in 2016, the art complex is a former vacant bowling alley with a unique immersive narrative experience designed to transport its patrons through the looking glass. 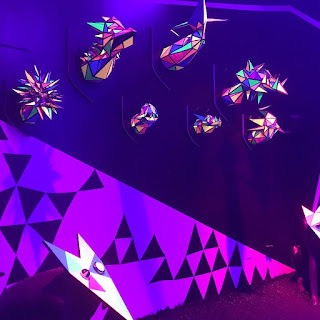 The permanent installation, House of Eternal Return, offers the mystery of the Selig family, whose home has become riddled with portals to other universes. 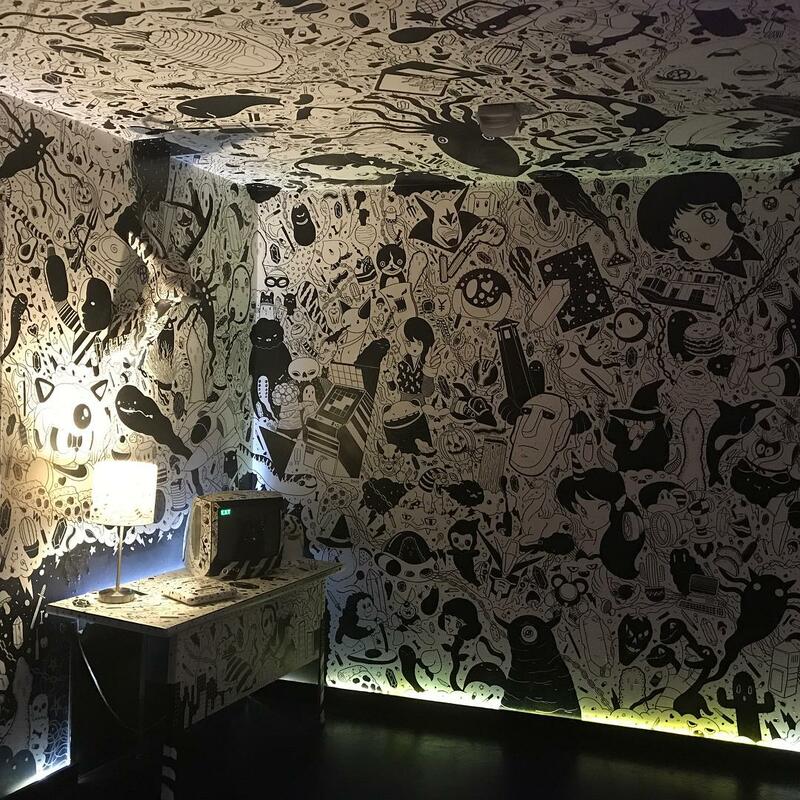 Visitors can move from room to room to explore and observe some of the inventive light and sound installations, conceived as an "adult" Disney Land of sorts, but far more trippy and weird. They consider themselves "part jungle gym, haunted house, children’s museum and immersive art exhibit." The experience was so interesting, that I spent a good two hours just enjoying the space. It happened to rain outside over the course of the next two hours, which I hadn't anticipated. With a little extra time on my hands, and a hungry stomach, I decided to grab another New Mexican treat, sopapillas, at Tortilla Flats, a chain restaurant located right next door. I then decided to head back to Albquerque, as I could see some dark clouds rolling in in the distance as the sun was setting. The drive back to Albuquerque was riddled with thunderstorms and lightning but thankfully far enough away. We had a delay getting out of the area possibly due to weather, but we get off the ground, and I conk out for the entire flight - a good thing, since I was going straight to the office the next day!